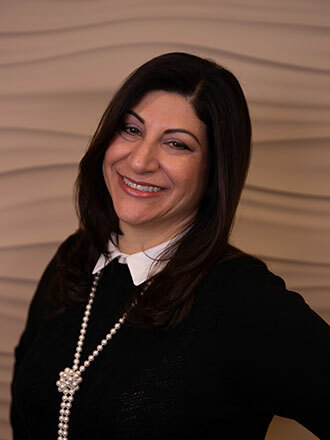 While providing the highest quality of dental care to her patients, Dr. Elaine Garver strives to make her patients feel as comfortable as possible. Dr. Garver believes in spending time with her patients to get to know them and their oral health. Her goal is to help a patient achieve a lifetime of excellent oral health, function, and esthetics. Dr. Garver graduated with honors from Brandeis University in Waltham, Massachusetts, majoring in Biology and minoring in Spanish. She then attended the University of Connecticut School of Dental Medicine and graduated in 2001. She completed a two-year residency at Nassau University Medical Center, where she was a chief resident and a student of Dr. Portenoy. Even after finishing her residency, Dr. Garver remained in the program for five years as an attending dentist. Dr. Garver was born and raised in Vernon, Connecticut. As a young girl, she knew that she wanted to be a dentist. Her father, a pediatric dentist mentored her and she happily followed in his dental footsteps. Dr. Garver always worked in his office on her high school and college vacations. Even though she is a New England girl at heart, she followed her college sweetheart Brett, and settled on Long Island. They have been married for 18 years and have one daughter. Dr. Garver is an active member of the Hewlett East Rockaway Jewish Centre (HERJC). She is a Vice President on the Executive Committee, a member of the Board of Directors, Co-Chair of the Board of Education, Co-President of the Religious School Parents Association, a member of the Gala Committee, and serves on various other committees. She participates in HERJC events as often as possible. You can even find Dr. Garver reading Torah from time to time. On March 3, 2018, Dr. Garver received the Emerging Leader Award at HERJC's Annual Gala. She is also involved in volunteer activities at her daughter’s elementary school.